Dar Es Salaam’s community mapping projects, Ramani Huria (“Open Map”) and Zuia Mafuriko (“Stop Floods”), convened by the World Bank and the Tanzania Red Cross Society, have collected a vast amount of data, detailing the city’s most vulnerable wards for floods in openly accessible maps. As a hydrologist working in Dar Es Salaam, I am interested to see if the data available can tell us how water moves through the city at ward scale (not including the streams flowing through the city) and if we can use it to set up detailed flood models. As part of a Challenge Fund project, Deltares (a Dutch research institute) started to assess what can be done with this vast amount of OpenStreetMap (OSM) data to increase the understanding of flood risk. Movement of water within the wards is particularly determined by detailed conveying elements such as drains, culverts and roads equipped with sidewalks, but also elements that block water such as elevated roads that do not have a significant facility for drainage, or conditions that lead to impeded drainage such as blockage by solid waste. A second block of information related to flood risks is the exposure of people, their livelihoods, assets as well as critical infrastructure to flooding. 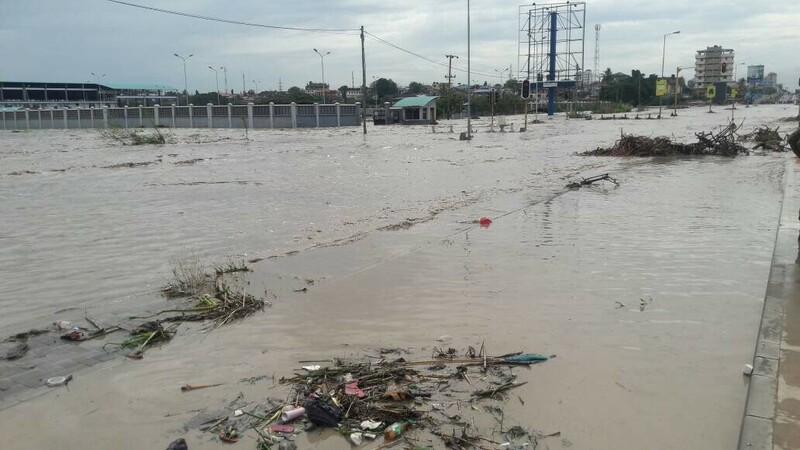 Especially during flooding, people depend on roads to move to safe places, churches, schools and central open spaces for relief, health centres for treatment, and police stations for security. Amongst others, at Deltares, we are building automated procedures to turn the OSM data into a dynamic flood model. I have worked on this with my colleagues Dirk Eilander, Arjen Haag and Mark Hegnauer. These models can simulate how water moves from one place to another under the influence of gravity, resistance, and inertia. Under normal conditions, this movement takes place in the existing network of drainage channels, culverts and so on. Understanding the amount of conveyance capacity in this network is essential. It is only when this conveyance capacity is exceeded that water needs to find a different route, which is over land. 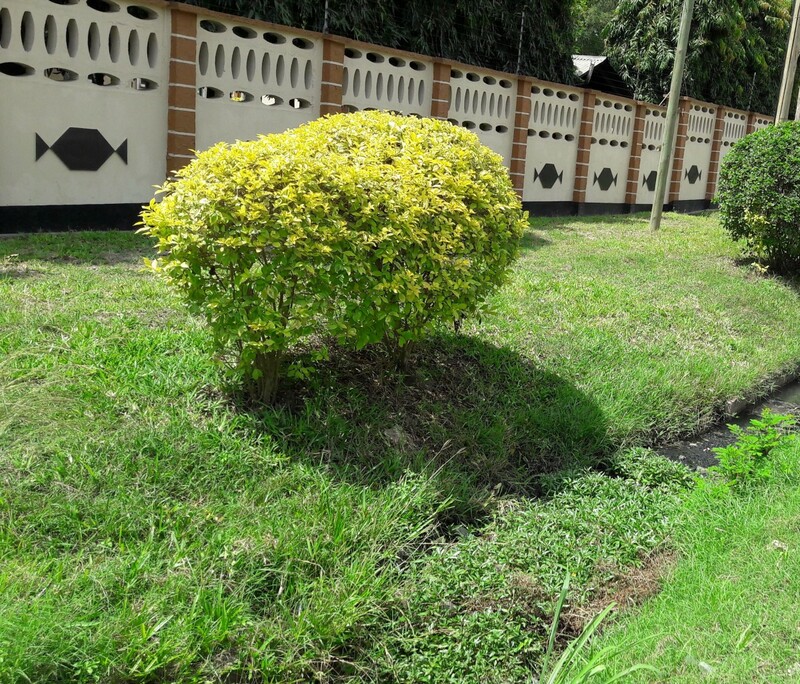 Here the collected drainage information in Ramani Huria is key. This information needs to be put in a 1-dimensional network model (see this link for a beginners example). Such a model can simulate how water is conveyed through this network and when this conveyance capacity is exceeded. It can be used to simulate rainfall scenarios, and effects of measures. In the remainder of this blog, I focus on the drainage system only, which includes rivers, streams, channels, ditches, and culverts. The question I’ll try to answer is: how far are we from being able to use the data of Ramani Huria for flood modelling? To support answering this question, Deltares is building a set of open-source (MIT license) hydrological data quality assurance routines hydro-osm, which I use throughout this blog. How well is the drainage network connected? A first condition that should be met is that the drainage network should be connected as much as possible. Within a flood model, wherever a disconnection appears, the model will “think” that water cannot move further downstream (even if the disconnection is small) and it will numerically seek another route over land. This can of course happen in reality, if drainage is improperly designed. In this case a disconnection in the drainage network, as mapped and stored in OSM would be appropriate. I found many occasions where drainage data seems to be improperly connected in OSM. One of our data quality assurance routines assesses the connectivity of the network by selecting a number of outflow locations such as the last segment of a river or stream, as it runs into the ocean, and then tracking back upstream which features are eventually flowing to either one of these outflow points. The interactive map below shows the resulting connectivity for the full Ramani Huria 1.0 coverage, using the OSM dataset from 23 August 2017. The initial view shows a typical example of disconnections at the crossing of Mnyamani Road and Kiembe Mbuzi road. Green colored drains are connected to an outlet near or along the coast. Red ones are not connected. You can zoom in and out of the map to check connectivity everywhere in the dataset. It appears that about 14% of all drains are disconnected. These disconnections should be revisited before using the data for flood modelling. Again, it could be that some of these are really disconnected, but my suspicion is that many in fact do have a connection. How well are tags mapped? Diameter: in case a round profile is found, the diameter can be used. This is typically the case with culverts. The two pictures below show examples of an open channel and a culvert. Although the tags mentioned above are very useful, they are not complete enough to understand the drainage capacity. For instance from depth and width alone, one may assume that a profile shape is rectangular or triangular or trapezoidal in shape. Assuming a triangular profile would result in a cross-sectional surface, half the size of a rectangular profile. The picture below in fact shows a drain with a trapezoidal shape. More information on the shape of the profile is therefore needed, and parameters should be measured, conditional on those shapes. Other parameters that would be needed or at least useful are vertical locations of the channels, material and state of maintenance. Interesting information includes whether a drain or culvert is blocked by solid waste, vegetation or other. Such blockages can seriously reduce the conveying capacity. In the photo on the left, it can be seen that a blockage is so extensive that it works as a weir, almost entirely blocking water from flowing further downstream. Finally, covered drains can be separated from open drains as well. These pieces of information are not covering all aspects required for a proper urban flood model, but they do offer a very good start. I will write more about extending the data model and required observation methods to accommodate the appropriate requirements in a later blog. Let’s first start with identifying the completeness of these tags. Our data quality routines can check the followed data model on a ward-by-ward basis. The results showed that in particular in the wards Buguruni, Temeke, Mzimuni, Msasani, Makumbusho, Vingunguti and Mwananyamala many features contain invalid values for these tags. This means that many of the features mapped, contain depth and width values outside (resp.) the 0 until 5, and 0 until 20 meter range, and diameters beyond the 0.1 until 2 meter range were mapped as well. A more in-depth investigation shows that 56 features have a diameter of 0.2 meter or less, 13 a value of zero, and 113 features a diameter of -1. Mappers may have been confused about what to map exactly and a more dedicated drainage mapping team with additional training targeted towards mapping of drainage is needed to improve this. The results of this data model check (for diameter, depth and width) are also displayed in the interactive map below. Go ahead and explore! The analysis shows that a lot of work was done, but to really have a complete view on the drainage system for detailed ward-scale flood modelling, a more complete data model and a more strict and conditional data collection protocol are needed. Besides this a good terrain model is required, but this is outside the scope of this blog. The good news is that Ramani Huria 2.0 initiated with a discussion on a solid data model and data collection protocols. 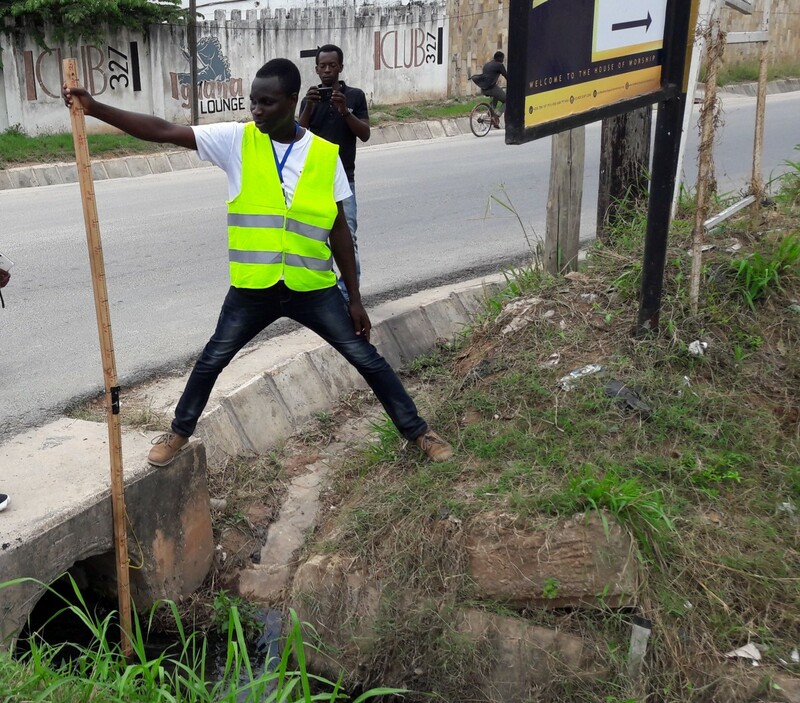 There are now dedicated drainage mapping teams working on this who have been trained in the requirements and protocols and OpenDataKit (by Humanitarian OpenStreetMap Team) is adapted and used to ensure that the required tags for given features and profile types are followed. More about this in the Ramani Huria blog here. The first results of these efforts look very promising and I am very eager to take the next step in OpenStreetMap based flood models. Later this month you can read our full report online.